At risk of stating the obvious, Fishtown continues to get more AWESOME. It’s pretty cool seeing so many different local, and national, news outlets constantly saying how great it is to be in Fishtown. I totally agree with them! On the pharmacy’s block alone, several super cool businesses have opened in the last few years. I-Fixit, Franklin and Poe, and Ham and Bone! Last year we donned our first ‘pharmacy costume’, which if you weren’t there, mirrored one of my family’s favorite books, The Lorax. This year the costume is based on two wonderful modern children’s stories: The Day The Crayons Quit, and the equally great sequel, The Day The Crayons Came Home. Oliver Jeffers and Drew Daywalt wrote the stories in 2013 and 2016, so unless you have a 2-10 year old, they likely aren’t in your library. Rest assured, they’re ‘top shelf’. A few months back, my son Wiley suggested the Crayon books be this year’s costume, and subsequently my wife thought of branching the costume concept out into a local biz scavenger hunt. Both brilliant ideas IMO. So we did! My family and I spent a LOT of ‘quality time’ together making a bunch of ‘life size’ crayon characters from the books over the last couple weeks. Truffula tree pool noodles were recycled in this process! #LoraxApproved. 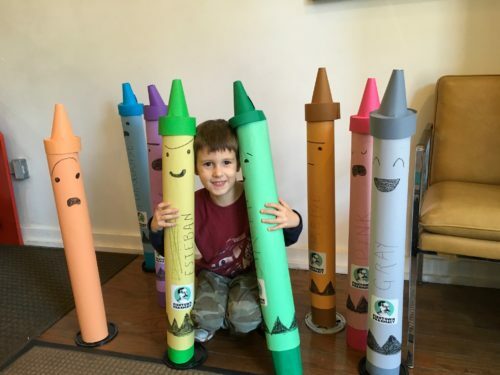 #CrayonsInFishtown invites everyone to bring their kids into Fishtown Pharmacy, and take a pic with our super-duper crayons. At that point, you will be eligible to pick up a scroll guiding your next steps. Your mission, should you choose to accept it, will then be to decipher the secret scroll containing the exact coordinates of 9 other local businesses where the remaining crayons can be found. As always, should you or any of your Crayon Force be caught, the Secretary will disavow any knowledge of your actions. Each participating business has been given a set of regular sized crayons to reward scavenger hunters. All hunters who capture 8 or more crayons, will be given their choice of either book.The scavenger hunt will run from 11-1-17 to 11-7-17. Your mission also has a noble cause! For every picture taken (and allowed to be posted on our social media) in the pharmacy with the crayons, I’ll donate $10 to By My Side Parenting. If you post a pic of your kiddos with the crayons in any of the participating businesses with #CrayonsInFishtown, I’ll add another $1 for EVERY post. If any new family transfers prescriptions into the pharmacy, we’ll raise our donation to $50 for each new family. If you aren’t familiar with By My Side Parenting, they’re amazing. If you need confirmation beyond me saying so, either ask someone with children in Fishtown, or visit their website. *Yes I know Denteek isn’t in Fishtown, but the dentist and owner is an old friend, and I believe he has opened the premier ‘green’ dentistry in Philadelphia. Its worth the trip to Northern Libs!